Purpose: Despite increasing awareness of the importance of leadership in healthcare, our understanding of the competencies of effective leadership remains limited. We used a concept mapping approach (a blend of qualitative and quantitative analysis of group processes to produce a visual composite of the group’s ideas) to identify stakeholders’ mental model of effective healthcare leadership, clarifying the underlying structure and importance of leadership competencies. Methods: Literature review, focus groups, and consensus meetings were used to derive a representative set of healthcare leadership competency statements. Study participants subsequently sorted and rank-ordered these statements based on their perceived importance in contributing to effective healthcare leadership in real-world settings. Hierarchical cluster analysis of individual sortings was used to develop a coherent model of effective leadership in healthcare. Results: A diverse group of 92 faculty and trainees individually rank-sorted 33 leadership competency statements. The highest rated statements were “Acting with Personal Integrity”, “Communicating Effectively”, “Acting with Professional Ethical Values”, “Pursuing Excellence”, “Building and Maintaining Relationships”, and “Thinking Critically”. 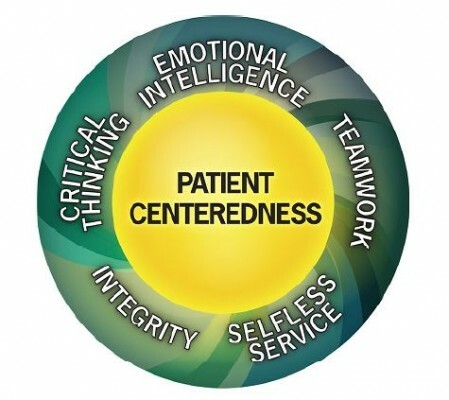 Combining the results from hierarchical cluster analysis with our qualitative data led to a healthcare leadership model based on the core principle of Patient Centeredness and the core competencies of Integrity, Teamwork, Critical Thinking, Emotional Intelligence, and Selfless Service. Conclusion: Using a mixed qualitative-quantitative approach, we developed a graphical representation of a shared leadership model derived in the healthcare setting. This model may enhance learning, teaching, and patient care in this important area, as well as guide future research.